GMA-7's veteran news anchor, Arnold Clavio is now centered on social media trending topics after a video showing his uncouth remarks to Atty. Alfredo Villamor, the new lawyer of Janet Napoles draws flak online. The incident happened today, November 5, 2013 on the newscast of 'Unang Hirit', morning show of the Kapuso network. Arnold Clavio in the phone-patched interview with Atty. Villamor according to netizens showed unprofessionalism and became rude after he got irked at the middle of conversation. TheSummitExpress witnessed on live television how Clavio handled the situation of he thought a senseless interview when he got nothing after the 3-minute live interview with Villamor. 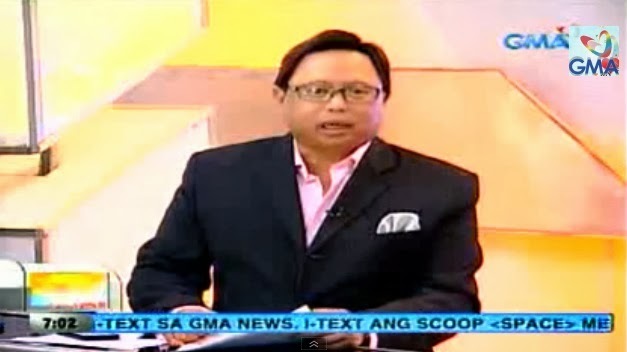 Just watched @UnangHirit today and it seems that Igan became unprofessional or not in good mood for an interview w/ Atty. Villamor. Agree? Clavio kept on asking about Senate investigation on pork barrel scam issue set on November 7 if Villamor will be Napoles' lawyer as the public know that Kapunan already resigned. Meanwhile, Atty. Villamor clearly explained that he’s just the lead counsel for the illegal detention case and not on the PDAF issue. Related: Why Lorna Kapunan resigned as Janet Napoles' lawyer? Netizens and televiewers also react on the part as Clavio cut the interview while Villamor is still talking. Clavio empahasized that the phone-patched interview is just a waste of time. “Sana pala hindi namin kayo natawagan, salamat ho, wala ho akong nakuha sa inyo. Salamat po attorney,” Clavio said. On Tuesday evening, Arnold Clavio trends on Twitter as most of the netizens have watched the video. A tweet from comedian Vice Ganda was retweeted and favorited more than 300 and 800 times respectively. Ah ok. Thanks guys for sending me the link. Now i know why Arnold Clavio is trending. Just saw the video. Still fresh in our minds, the GMA anchor lashed out against the ABS-CBN comedian for making vulgar jokes about fellow GMA anchor and GMA vice president for News and Public Affairs Jessica Soho during his concert at the Smart Araneta Coliseum May this year.